The Washington Area Folk Harp Society started in 1982 as a group of friends meeting every other month to play tunes together. From this start, the group has grown into a full-fledged society and a chapter of the International Society of Folk Harpers and Craftsmen, Inc.
WAFHS relies on the talented and generous volunteers who help run the society. Here is the list of volunteers. 2019 WAFHS Scholarships WAFHS is pleased to announce the 2019 WAFHS Student Scholarships. There are three WAFHS Lever Harp Music Scholarships available for members of WAFHS. Any member of WAFHS (age 14 or older anytime during the 2019 calendar year) who applies will be considered for one of these scholarships. The scholarships can be used for any worthwhile harp-related purpose. All application materials should be postmarked or emailed no later than March 2, 2019. Honoraria for Charity Performances Information about the WAFHS honorarium for charity performances is now available. The application form is also available. Harp Circles WAFHS encourages its members to participate in harp circles. 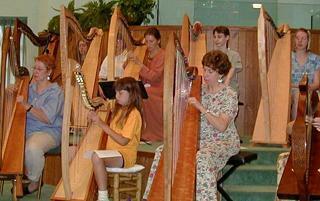 Here is a list of harp circles in the greater Washington, DC, area.